The T&R Super Plate, unique outboard engine jack. Gives you the ability to adjust your engine down-for best pulling power and quicker planning or up-for maximum speed or shallow water operation. With the touch of a switch you can find that optimum height, even while under way at full speed. Each unit is constructed of 6061-T6 aluminum alloy with all stainless steel fasteners. Special grooved slide tracks made of UHMW wear plate material allow the adjustable engine plate to go up and down freely while offering superior life. The hydraulic power unit is mounted inside the boat for maximum protection and not submerged in the water as some other manufacture's pump are. 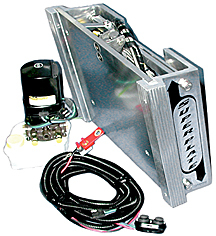 Two six foot braided stainless steel hydraulic lines are provided along with a fifteen foot wiring harness. The hydraulic pump is designed to use any standard automatic transmission fluid and the system operates without any relays or solenoids for minimum maintenance. We have been providing the marine industry with quality jacks since 1978.